Patrick Gates shook hands with the surveyor through the car window. He stepped back onto the grass verge and waved until the Audi disappeared around a bend. He turned back to the narrow stretch of tarmac that was more pothole than road. A shadow fell across his path. Patrick looked up to see a short woman appear out of the twilight beside him. “You’re the council man. You’re here about the crossroads, aren’t you?” she asked. “Yes, I’m the local councillor for the village. Patrick Gates.” Patrick held out his hand. “You’re going to build over the crossroads.” She ignored his outstretched hand, twisting a floral scarf between her gnarled fingers. “Well, yes. We’re bringing this road up to date to improve the local area,” replied Patrick. He gestured to the road running north-south and flashed the mega watt smile he usually reserved for the press. “You can’t do that! You can’t destroy the crossroads!” The short woman seized his arm and stared up into his face. Patrick fought to break the gaze of her wild eyes. “We’re not destroying anything. We’re enhancing the driving experience on this road.” Patrick struggled to keep the dazzling grin intact. “Our archaeologists have ascertained that any remains buried will be too far down to be disturbed.” Patrick glanced at the car. How far away was it? Maybe twenty paces? Fifteen, if he hurried. “Excuse me, madam, but I need to be getting back to my office. I promise I’ll get someone to come and talk to you about your worries, but if you want to discuss it further tomorrow with me, then you can,” said Patrick. He unclamped the woman’s fingers from his arm and slipped a creased business card into her cold hand. Patrick strode down the road to the car. He risked a look over his shoulder but the woman was nowhere to be seen. Patrick reached his BMW and climbed inside. He adjusted the rear view mirror and looked at his reflection. “Stupid locals! How dense do you need to be to believe crap like that?” he asked. Patrick started the car and drove into the encroaching night, keen to put as much distance between himself and the crossroads as possible. Four days later, Patrick coaxed the BMW onto the grass bank beside the orange safety barriers. He climbed out of the car and surveyed the change in scene. 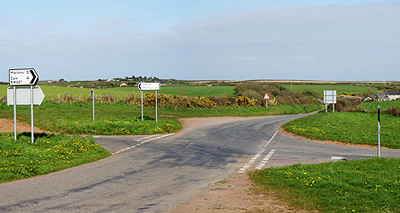 A dotted white line divided the new tarmac road in two, following the curve of the bend. Machinery clustered around the entrance to the old eastern branch of the crossroads. The barriers blocked the western branch. He fished his phone out of his pocket and checked the time. 20:11. Gary Holt from the local newspaper should be here by now. Patrick checked his email in case his secretary had sent him Gary’s phone number, but the message simply said Gary wanted some atmospheric twilight shots for the paper. A gust of wind skittered across the road. Something fluttered near the machinery. Patrick’s voice carried across the road. He looked both ways for the signs of an approaching car. Another gust of wind danced along the old east-west road, raising a mournful moan. Patrick shuddered. More movement beside the machinery caught his eye. He swallowed his growing unease and crossed the road. A scrap of material rippled along the ground, caught between two stones. Patrick pulled it free. A familiar floral pattern covered the delicate chiffon. He turned it over in his hands. His fingers found a dark sticky patch. Dusk bleached colours from his vision, and Patrick lifted the scarf to his nose. An acrid metallic smell filled his nostrils. Patrick gagged and tossed the scarf away. He fished in his pocket for a handkerchief to wipe the blood from his fingers. A growl came from the bushes to his left. Patrick lurched forward and hurried back to the BMW. He clambered inside and locked the door. The clock glowed in the dashboard. 20:13. The sound of horses’ hooves made Patrick look out of the window. A tall black horse stood in the centre of the road behind the car. Patrick followed the body of the rider upward to the neck, and then empty sky. Bile burned his throat. The headless horseman pointed an index finger in Patrick’s direction. Shadows flitted across the road and cackling filled the cool evening air. Patrick fumbled with the keys. The BMW sputtered, its engine turning over but refusing to start. He looked out of the side window to see a pair of yellow eyes glaring at him from the hedge. A heavy thump on the roof rocked the car and he winced at the sound of claws on metal. Something hissed on the back seat. Patrick glanced at the rear view mirror, but the car was empty. Patrick only saw the headless horseman patrolling back and forth across the road. Skeletal fingers wrapped in shreds of rotting flesh crept across the headrest of the driver’s seat. Ragged nails brushed Patrick’s ear. A yelp forced its way between his lips and he turned around. A figure sat on the back seat, skin peeling away from its yellowed skull. Red eyes burned in the deep sockets and decayed lips exposed the razor sharp canine teeth. A clawed hand to the throat stole Patrick’s scream before he could unleash it. The prompt for this piece came from Daniel Brown, AKA @FunkyScarecrow, whose blog you can find here. He asked, "What happens when a crossroads gets demolished? Where do the demons, black dogs, ghosts and spirits of the hanged go?" Awesome concept ... what happens when modern unbelief runs into ancient superstition/beliefs? Great execution, Icy. Crossroads are crossroads forever. Nice one, Icy. Brilliant story plot. Great telling. I'm reading this on the stroke of midnight. I will now need to find something to distract me before I can go to bed. Well done. That was just about a perfect prompt for you. Nice. I'm always game for stories of the primal forces cropping up when disbelief releases their shackles. Never thought about crossroads demons and construction, though. Makes me a little nervous about what's going on near our town. I love it. Ever since first reading about the legends surrounding crossroads' as a little kid, they've fascinated me. So much mythology and folklore, all concentrated around such a simple construct. Standing on an isolated crossroads, with the road stretching away in all directions, it can feel as if the world is coming to a point and all of its focus is on you, the lonely traveller. You've captured that feeling beautifully. Spooky! I love it, crossroads and demons and headless horsemen. Janet - Disbelief can only take you so far! FAR - Having met some...I agree! Tim - Yeah, it is sort of up my street, isn't it? Michael - Why thank you! John - Oh no, are they digging up a crossroads? Daniel - Thank you for the prompt! The concept is very intriguing. Great use of the crossroads as something more dark and mysteriious. Love the last line! Being a Top Gear viewer I was glad to see a BMW driver getting what was coming to him :P.
But seriously great story and from the headless horsemen on, very creepy. He should have taken more notice, folklore and superstition are usually based on some kind of fact.. unluckily for him. Now that I'm reading the comments, I am learning there are crossroads legends--outside of the movie with Ralph Macchio battling the devil. Cool concept, and executed to perfection, Icy (but we expect you to scare us). Good story Icy, teach him to laugh at the locals won't it! I really liked the concept of the crossroad binding the demons. Creepy, Icy tres creepy. Still, if the surveyor taken any lessons from the film Poltergeist he would never have messed with forces best left undisturbed. Now they see what happens when they go building a bypass on the dead. Very good Icy. Loved that old lady, and plenty scary stuff skulking about in the machinery. St. Some beliefs are beliefs for a reason. Loved the way you captured the creepiness at the end as he pays for paving the crossroads. Wonderful, wonderful build up at the end there. Yerk. I got the creeps, especially with that skeletal hand. I could always tell where this story was going but you made it there with a lot of skill. And this: “We’re not destroying anything. We’re enhancing the driving experience on this road,” made me laugh out loud.